Kunsthuis Gallery's 2018 exhibition "Our eARTh' invited artists to respond to the theme of climate change. The show will run for 9 months from March, shoiwing work by international artists. I was delighted to have three pieces selected for the exhibition. Ruth's account of the development of this series of watercolours. Three watercolours will soon be off to Yorkshire. All are contemplating the effect of climate change on rising sea levels and consequent damage to our coastlines, including the vulnerable saltmarshes. Close to home, the River Blyth flows out towards the North Sea across wide mudflats, which once would have been filled by saltmarsh interlaced with an intricate complex of gullies and creeks, but which now is a beautiful empty landscape mirroring the vast East Anglian skies. 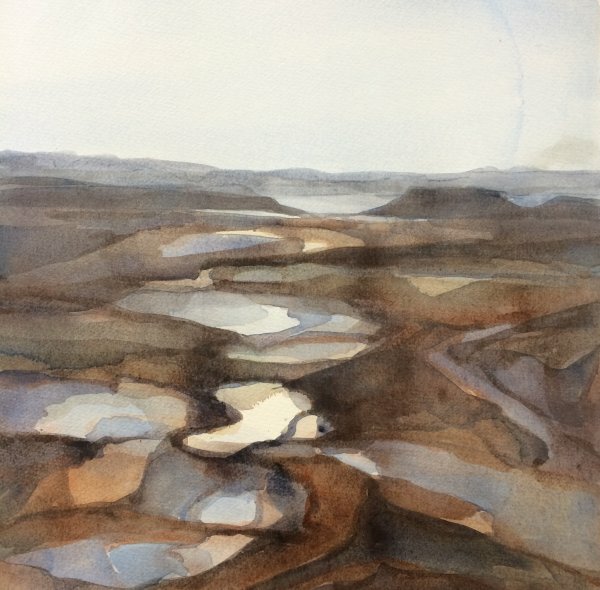 This piece shows the emptiness of this visually stunning place, but also hints at the lack of species diversity due to saltmarsh degradation by the tidal flow. Work could be done to help accretion (deposition of silt), but bureaucracy has created an impasse and several years progress has been lost. Ten or so miles down the coast, Hazlewood Marsh tells a brighter story. Overnight in December 2013, storm forces and an exceptionally high tide breached the sea wall in several places. The freshwater marsh, which had been preparing sites for Avocet nesting, was inundated by salt water. Common sense prevailed and in the next few years, the marsh became a healthy intertidal habitat, supporting a wide bio-diversity. The watercolour shows the breaches and the remaining sea wall, which helps to slow the outgoing tide. Silt can accumulate around the edges of the islands created for the Avocets and the site is now an excellent example of working with nature's own forces. Over time the salt marsh will rebuild and become a natural defence against extreme further tidal events. The final piece for Kunsthuis: an imagined close examination of accreted silt. I've used the ethically produced Two Rivers 700lb hand made paper which provides a wonderful support and great NOT surface into which pigments settle, mimicking how silt accretes. It is this wonderful muddy stuff that allows saltmarsh plants to germinate and take root. Regeneration of the marsh then works to slow tidal flow and dissipate the force of higher tides as they flow into all the gullies and creeks.